Alex: The restaurants along the promenade in Circular Quay have mainly remained untouched by Team FFS, not for any reason in particular but more so, the common stigma that follows most restaurants that are smack bang in the middle of tourist hot spots. These being the price tag, service and the quality of food. 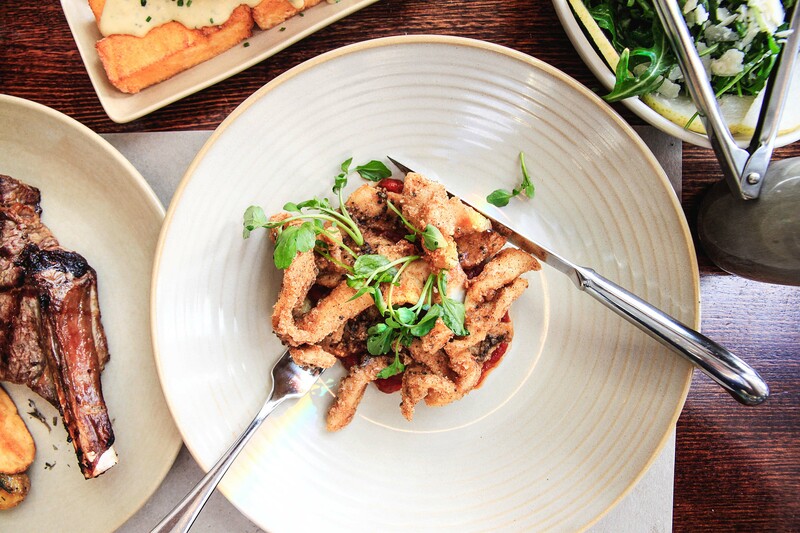 After a recent invitation we made our way down to Eastbank Circular Quay. I feel bad saying this, but before we arrived we weren’t really expecting all that much. After our experience let’s just say I probably shouldn’t rely so much on what other people tell me. Upon arrival we were greeted by the lovely Shakila who showed us to our seats. It’s no doubt that we’re blessed with some of the best views in the world. Our seats overlooked the harbour so it’s definitely not a bad place to lounge around and enjoy the view while sipping on a glass of vino. First up was the Garlic bread $6 – ciabatta bread with garlic butter. 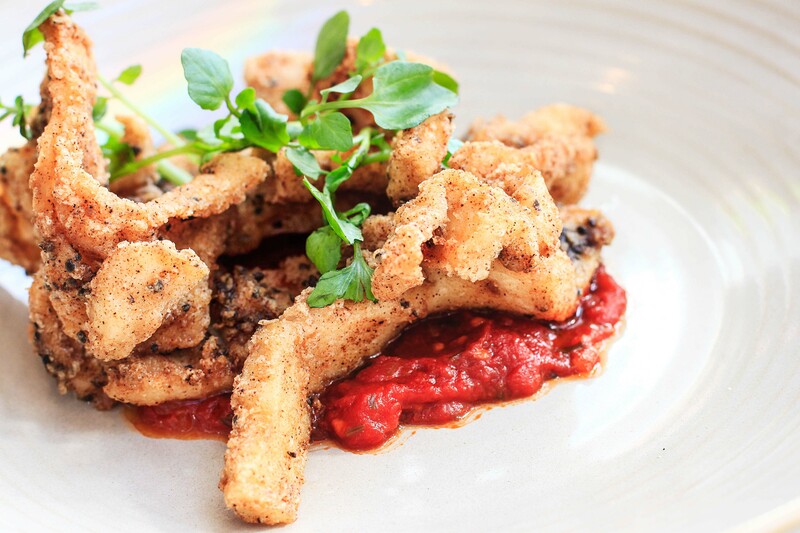 A must order at any Italian restaurant is the Salt & pepper dusted calamari fillets with tomato & coriander ragout & watercress leaves $23 The calamari was extremely tender with a great seasoning but it was unanimous that the tomato based sauce let it down. What I found interesting though, was that when I tried the calamari with the sauce from the gnocchi it worked much better. Perhaps they should incorporate that hot sauce with the calamari instead? The Zucchini flowers stuffed with buffalo ricotta, mascarpone, black truffle paste and lemon gremolata $23 had hints of citrus in the filling with a well balanced creamy filling. The exterior was crunchy with a hint of truffle. These were decadently rich but very tasty. The Gnocchi Alla Sorrentina: Hand rolled potato gnocchi, Napoletana, buffalo mozzarella, basil & parmesan $26 was the stand out. Very well developed sauce which we were extremely impressed by. The gnocchi was soft whilst still managing to have a bit of bite. I was a bit concerned when I first noticed the large chunks of tomato in the sauce but it actually worked really well. The side of polenta chips $10 smothered in gorgonzola sauce was rich and crumbly and the Rocket & pear salad with shaved parmesan cheese, balsamic & e.v.o.o $9 is always a welcome addition to any meal. Our second choice for main dishes was the Dry aged rib-eye 400G with Roasted kipfler potato and salmoriglio sauce $43. The meat had a nice charred flavour with a wonderful after-taste of rosemary from the accompanying sauce but the potatoes needed a hint more seasoning. So it’s fair to say that we were quite impressed with the food! The prices are still quite expensive, but obviously you’re paying for the view and location so fair call I guess. *For Food’s Sake were invited to dine as guests of EastBank, all opinions however are our own and independent. Big thank you to Stephanie for organising our visit and Shakila who took great care of us. It’s a tough area to go to because of the prices but at least you liked the food. The worst is when you pay high prices for food that isn’t great but the view is good. The gnocchi does look very rustic. Thumbs up from an Italian is high praise indeed!